"I don't know, maybe it's normal…? It's not normal. I know it's not normal…!" The Orchard has released an official trailer for an indie horror thriller titled Tilt, from Iranian-American director Kasra Farahani. This premiered at the Tribeca Film Festival last year, but like most Tribeca films, we've never heard of it before now. Tilt stars the young actor Joseph Cross as an unemployed documentary filmmaker whose behavior becomes increasingly erratic in the months after his wife becomes pregnant. The full cast includes Alexia Rasmussen, Jessy Hodges, C.S. Lee, and Kelvin Yu. This looks like a chilling psychological thriller, for sure. I'm not exactly sure how the pregnancy story plays into things, perhaps it is what sets off his insanity. Something is off about Joe (Joseph Cross). He's not excited about the baby. He watches Joanne (Alexia Rasmussen) as she sleeps. Late at night, he roams the streets of Los Angeles courting danger. As Joseph struggles to maintain his domestic life, his mask begins to slip. 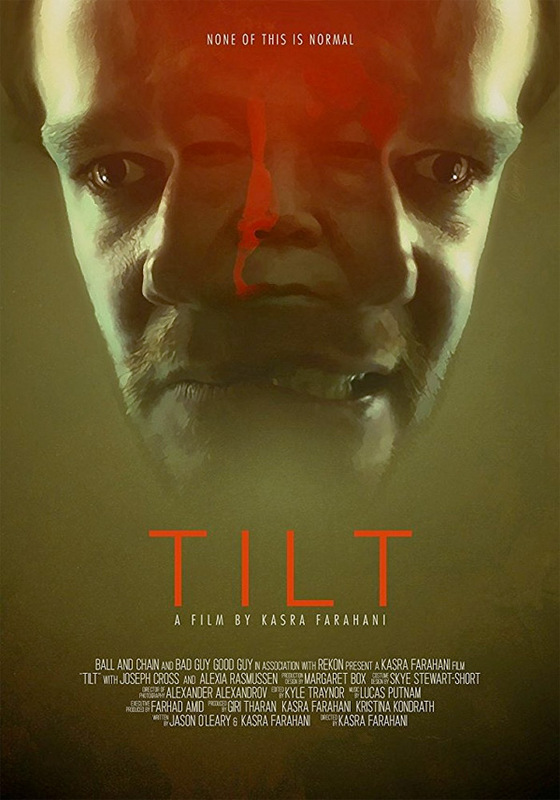 Tilt is directed by up-and-coming Iranian-American filmmaker Kasra Farahani, an experienced concept artist making his second feature film after directing The Good Neighbor previously. The screenplay is written by Kasra Farahani and Jason O'Leary. This first premiered at the Tribeca Film Festival last year, and also played at the Fantasia Film Festival. The Orchard will release Farahani's Tilt direct to VOD starting on March 13th next month. Anyone interested?